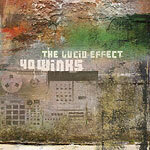 Belgian producing duo 40 Winks are known for their laid back atmospheres and vibes. However, after 5 years of looking for the perfect beat, they decided to break free from the usual mold and dive into the unknown for The Lucid Effect. Having reached listeners in different scenes and parts of the world, they have decided to incorporate all of their favorite genres and styles into their own experimental project, to create an instrumental album in which the traditional boundaries of rhythms, tempos and sampling techniques are wildly stretched. Instrumental hip hop aficionado or not, music lovers are bound to find a treat in this one! Very reminiscent of DJ Krush and definitely for fans who have enjoyed other great releases such as Signal Path from the Hip Hop Vinyl label based out of Germany!